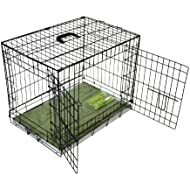 FOLDS FLAT FOR EASY STORAGE AND TRANSPORTATION DOUBLE DOOR MODEL WITH TWIN LOCKING LATCHES INCLUDES FREE SUPER SOFT PET BED MADE TO FIT. ( COLOURS MAY VARY ) EASY CLEAN SLIDING TRAY SUITABLE FOR THE FOLLOWING BREEDS OR SIMILAR SIZE DOGS Basset Hound, Beagle, Border Collie, Miniature Bull Terrier, Bull Terrier, Staffordshire Bull Terrier, Bulldog, Dachshund, English Springer Spaniel, Field Spaniel, Finnish Lapphund, Finnish Spitz, Giant German Spitz, Hungarian Puli, Irish Terrier, Pinscher, Shar Pei, Sky Terrier, Soft Coated Wheaten Terrier, Standard Schnauzer, Welsh Springer Spaniel and Whippet. 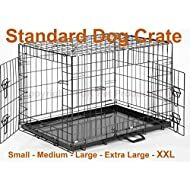 Do measure your dog before purchase to ensure they have enough room to lie down, stand up and turn around. FEATURES - 2 Doors for easy access/exit. - Movable carry handle. - Folds flat for ease of storage and transportation. - Non-chew removable tray for easy cleaning. - Two heavy duty latches on each doorway. 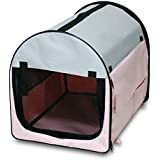 - FREE SUPER SOFT PET BED AND LINT ROLLERS INCLUDED. Find a wide selection of products from BUNNY BUSINESS at low prices as well as a range of pet toys, food, treats, bedding and more at Amazon.co.uk. 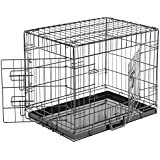 Bunny Business Metal Dog Crate 2 Doors Bedding Lint Rollers Extra Large 42 Inch Black available now from PetPlanet.co.uk the UKs #1 Online Pet Store.